Jamie Fullarton applauds from the sidelines. 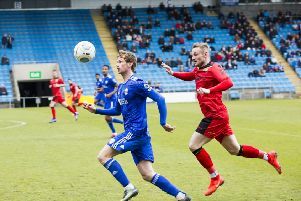 FC HALIFAX TOWN boss Jamie Fullarton wants his side to pick up where they left off at Solihull when they travel to Havant and Waterlooville tomorrow. The Shaymen bounced back from their underwhelming defeat to Eastleigh last Saturday with a battling goalless draw against high-flying Solihull on Tuesday night. And Fullarton wants to take that level of performance into their clash tomorrow. When asked whether the Solihull game would have any bearing on the match, he said: “When we talk about results, it’s performances we really look at, because they give you a better chance of having consistent results. “With the performance on Tuesday, and the reaction to a disappointing performance and result last Saturday, I’m not surprised by the reaction, because I work with them every day, and I brought most of them in. "So there is an expectation that they would have a reaction like that, and they didn’t disappoint from that aspect.